Since our arrival in San Antonio, we have been able to try some of the local cuisine. Or, to be more specific, some chain restaurants that are non-existent in Quebec (we’ll get around to the local Tex-Mex restaurants, don’t worry). We also noticed some differences in everyday things, like all the delicious gourmet candy available at the corner store (some of it was Latino, but a lot was actually Asian, for some reason). We saw a Double-Down sandwich at a KFC in Kentucky (up until then, those sandwiches had been the stuff of legends to me – legends as in “unverified accuracy”, not “legen-wait for it-dary”). Even brand-name chips have different flavours, like limón (good, but I prefer our good old ketchup flavour). We had burgers at Five Guys Burgers and Fries. Just before I left Montreal, I learned that a location is supposed to open in the Old Port. 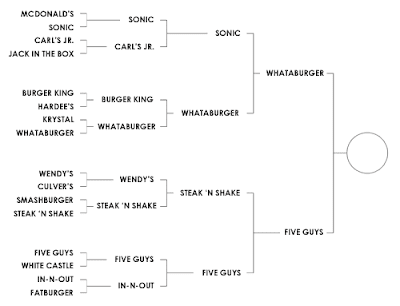 It’s recently beat out all the other fast-food burger chains in a consumer-vote face-off on A Hamburger Today (below is a chart of the participants, filled out right before the winner was declared). 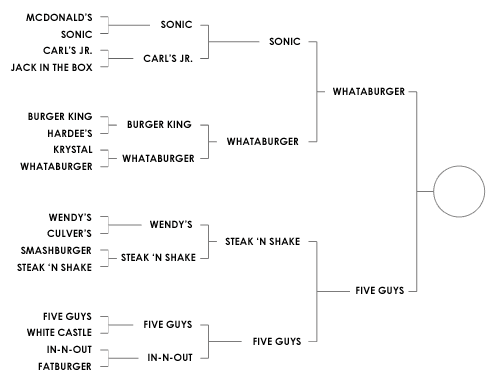 Five Guys makes good burgers, grilled when you order them and topped with everything you want, but they are definitely in the fast-food end of the spectrum. Their fries are ridiculously good and plentiful, though. I must mention that they serve free bulk peanuts in the restaurants, with the weird warning not to remove them from the premises for fear of allergens. So... it’s okay as long as they’re still on the premises, next to the food? We also tried Chipotle. This chain is technically fast food, in the literal sense – it’s prepared quickly. But it’s healthy: most of the meat is naturally raised (fed a vegetarian diet without hormones or antibiotics, and pasture-raised when possible), vegetables and legumes are from local family farms and organic when possible (and fresh – I believe only the corn is frozen during off seasons), and they were trying out soft tortilla shells made with a 3,500-year-old recipe. The guacamole is awesome; I had a pork burrito which I loved (and I can’t believe I ate the whole thing); the Engineer had a chicken burrito and declared himself thoroughly satisfied. We heartily approve of the place and will definitely be back. I’ll quickly mention Sugarbakers, which is not a chain. It’s a cafe and bakery where they serve breakfast and lunches, but I went in there lured by the (what else) red velvet cupcake. It was really good, and the highlight of my day.